International Luncheon Attendees (from left): Susanne T. Stirling, CalChamber vice president of international affairs; Ingrid Heggø, Labour Party Member of Parliament(MP); Ove Trellevik, Conservative Party MP; Ingunn Foss. Conservative Party MP; Oskar J. Grimstad, Progress Party MP; Sivert Bjørnstad, Progress Party MP; Morten Ørsal Johansen, First Vice Chair and Progress Party MP; California Senator Richard Pan (D-Sacramento); Line Henriette Hjemdal, Christian Democratic Party MP; Pål Farstad, Liberal Party MP; Frank Bakke-Jensen, Conservative Party MP; Knut Storberget, Labour Party MP; Odd Omland, Labour Party MP; Else-May Botten, Labour Party MP; Jock O’Connell, international trade economist, Beacon Economics; Marit Halleraker, Secretary, Parliamentary Standing Committee on Commerce and Industry; Sindre Bornstein, consul, Norwegian Consulate General; Andrew Grant, president and CEO, Northern California World Trade Center; Hilde Janne Skorpen, Consul General of Norway; and Daniel Lopez, chief of staff for Senator Pan. 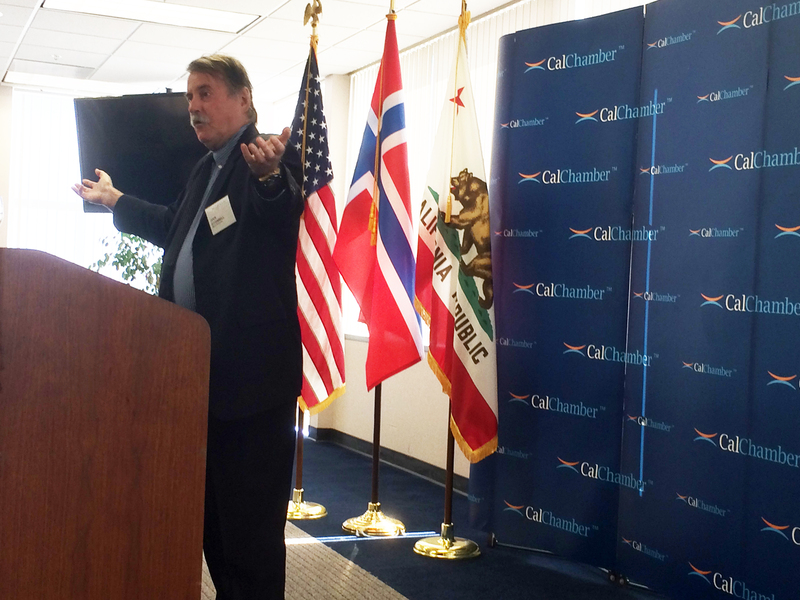 The numerous areas that affect trade and investment between Norway and California were the subject of a lively exchange at a September 15 luncheon meeting held at the California Chamber of Commerce. 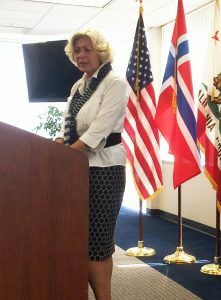 Attendees included representatives of the Parliament of Norway, Consulate General of Norway, and the Northern California World Trade Center. 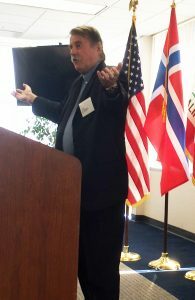 The lunch was part of a week-long tour of Northern California by the Norwegian Parliamentary Standing Committee on Commerce and Industry. Accompanying the delegation was Committee Secretary Marit Halleraker. California Senator Richard Pan (D-Sacramento) and Jock O’Connell, an international trade adviser with Beacon Economics, provided information to the international visitors about California’s political and economic environment, as well as a brief history of the state. Senator Pan spoke about exports from California and Sacramento, notably almonds produced by Sacramento-based Blue Diamond Growers. Dr. Pan remarked that the government in California can work to solve problems effectively, especially with pressing issues such as climate change and immigration. O’Connell provided a brief history of California, from the discovery of gold in Coloma in 1848 to the rise of the film industry in Hollywood to the prominence of Silicon Valley. He also spoke about the economic geography of California, noting the prominence of the ports of Long Beach, Los Angeles and Oakland. O’Connell also highlighted California’s status as the top producer of agricultural products in the United States. 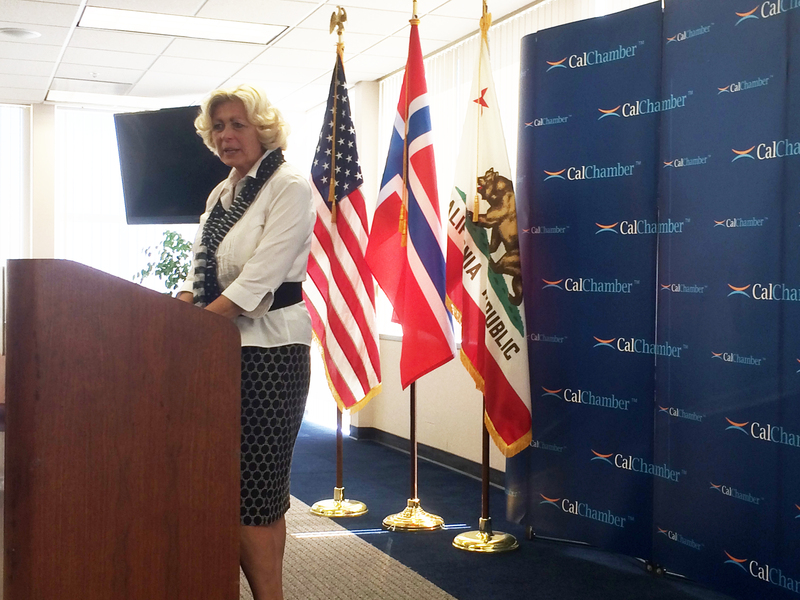 CalChamber Vice President of International Affairs Susanne T. Stirling served as the luncheon master of ceremonies and provided a brief overview of relations between Norway and California. 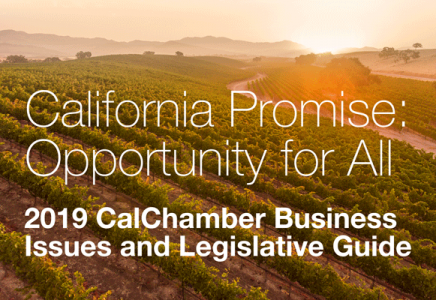 Also in attendance were Hilde Janne Skorpen, Consul General of Norway; Sindre Bornstein, Consul of Norway; Toni Symonds, chief consultant of the California Assembly Committee on Jobs, Economic Development and the Economy; and Andrew Grant, president of the Northern California World Trade Center. Conversations touched upon topics such as the California legislative and regulatory process; state, U.S. and Norwegian election politics; and presidential candidates’ attitudes toward pending trade agreements. The tour for the Norwegian members of Parliament included the State Capitol, the University of California, Davis, and Bay Area companies, such as Tesla and Google. Norway has one of the most financially healthy economies in the world, with a gross domestic product (GDP) of $499.8 billion in 2014, in part due to its status as the world’s 11th largest exporter of crude oil and third largest exporter of natural gas. Other major industries—such as shipping, shipbuilding, fishing and fish farming, information technology, pulp and paper products, and light metals processing—have prospered as well. Incomes are more evenly distributed, making every person a consumer. Unemployment rates and interest rates are low. Norway has close ties to the United States, the overall economic and trade relationship is strong, and Norway’s import climate is generally open and receptive to U.S. products and investments. In 2015, the United States exported $3.59 billion to Norway, making it the United States’ 49th largest export destination. Top exports included: transportation equipment (30%), nonelectrical machinery (13.4%), computer and electrical products (11.9%), and fabricated metal products (7.7%). Also, in the same year, the United States imported $4.7 billion, and top imports included: petroleum products (28.1%), primary metal manufacturing (10.4%), chemicals (10%), and nonelectrical machinery (8.2%). In 2015, Norway contributed $20.8 billion in direct investment to the United States, while U.S. direct investment totaled $33.6 billion in Norway that same year. In 2015, California exported $416 million to Norway. Top exports included: transportation equipment (42.4%), computer and electrical products (17.6%), agricultural products (7.3%), and food manufactures (6.1%). Likewise, Norway exported nearly $238 million to California. Top exports included: other animals (22.4%), fish, fresh/frozen and other marine products (20%), chemicals (18.8%), and transportation equipment (8.6%). 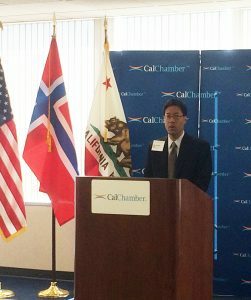 For further information, visit www.calchamber.com/Norway.